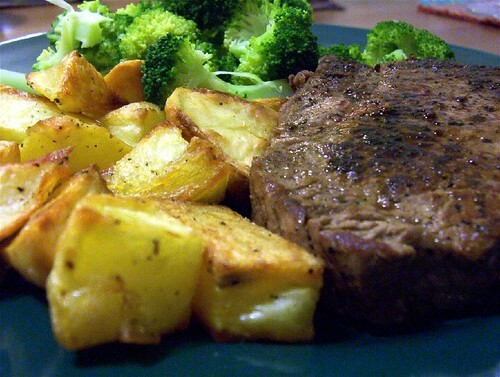 The steak was salted and peppered, allowed to come up to room temperature, and pan seared until just done. J made a pan sauce with chicken stock and some chianti from the freezer. The potatoes were cut into chunks about an inch across, rubbed with olive oil, salt and pepper and put in a 400° oven for half an hour or so. I turned them a couple times so they’d get crusty all around. The broccoli was chopped up and steamed. We poured the pan sauce over everything. We opened a bottle of Sandhill Cabernet that we bought at the winery in Benton City last September. It was awesome. Sometimes it doesn’t need to be any more complicated than that.